Although, I must admit, it has been a long time in coming. I started this quilt in January 2001 with the very best of intentions (isn't that what we all say?) but due to a Lot of Stuff Happening, this project got deferred for a Very Long Time. However, back to the beginning .... I wanted to make a Double Wedding Ring quilt. It's a fantastic design and can have so many looks. This would be my first one and I wanted it to be special. I did quite a bit of research on the process of creating a DWR: I wanted a DWR that had individual fabrics for the arcs but didn't want to work with all those little pieces. I definitely didn't want a one-piece arc ... that just seems so "wrong"! I finalized on the technique developed by John Flynn, which ingeniously creates true arcs with wedge-shaped pieces by using strip sets. Quite by circumstance, one of my local quilt stores had scheduled a class in exactly that method! I realized this was serendipitous and I ought to take advantage of it. Between the time I signed up for the class and the classes actually began, I made a sample ring (see left) just so I would have a working familiarity with the process. While working through several colorations, I decided on graduated arcs in 6 shades of red and 6 shades of black with a sparkle cream for the interior of the rings: a contemporary color scheme for a traditional pattern. Further delusions convinced me that 12" was the ideal size for the rings. Complete insanity dictated that this would be a queen-sized quilt. 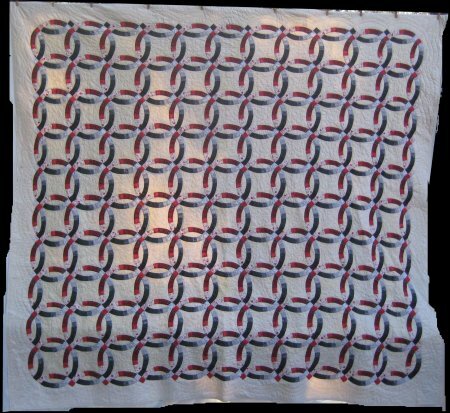 Now, I'm not one who usually goes around talking about the 57,000 spools of thread used or the 15,000 acres of fabric used or 1 million hours it took to create a quilt. But who knew that 12" rings for a queen-sized quilt would result in 241 arcs to be sewn? That's just a whole lot of flippin' arcs! As I worked on the rings, I began to see just how very pretty that combination of colors was. The class was structured in an interesting manner: because the entire quilt is essentially one block, the instructor had us go through all the steps to completely finish just ONE block. 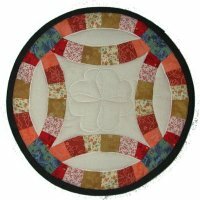 This meant that we did not cut ALL the strips, did not make ALL the strip sets, did not cut ALL the melons & center pieces necessary to complete the quilt. It would be up to us, on our own time, to do the rest of what was necessary. As I attended the classes and worked on my own, I cut enough fabric to enable me to complete 10 rings, which would be one column (or row, depending on how you hang it) of rings. I also cut a LOT of fabric and made a LOT of strip sets when the aforemention Stuff Happened and I let this project lapse. I put all sewn sections, the partially completed portions, the piece parts, the workbook and extra fabric in a cubby and put it away. In the intervening years, this project would nag at me. The cubby sat on my bookshelf, taking up space. 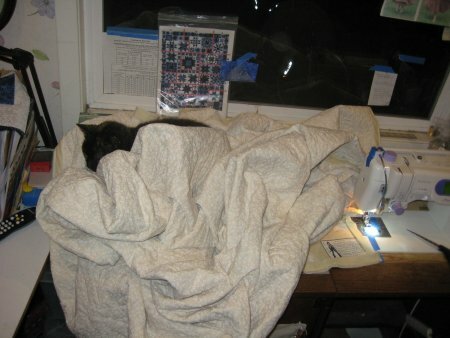 I couldn't return the fabric to the general population because the quilt wasn't done yet. Yet, there it sat. Now, let us flash forward to 2009. Our family experienced two deaths in quick succession; one not unexpected and one a total surprise. When we are young, our entire life spreads out before us and there is time for everything. But, as we get older, we begin to realize that time can run short. Unexpected terrible things do happen and all those activities that you had intended on doing are never going to be done. At that point, I set my mind to working on my old UFO's (UnFinished Objects, so that I could have the satisfaction of seeing them completed and given to the intended recipient. To anyone interested, the John Flynn method of doing a Double Wedding Ring, though still sewing-intensive, is just a whole lot easier than dealing with all those individual wedges of fabric.. The arcs are created with straight cut strip sets, which are then adjusted to create the arc shape. But be aware: it's still a lot of sewing. For *me*, this is a much easier method than using templates or (worse) cutting hundreds of wedge-shaped units to be stitched together. I doubt if it is any "better" than other methods .. it's just a different technique. step 2 goes from the sub-cut strip set to the arc unit. You create the arc unit from the sub-cut strip set by essentially sewing 'darts' on each of the sub-cut seams. I also have graduated red arcs that aren't pictured here. This is the basic unit. 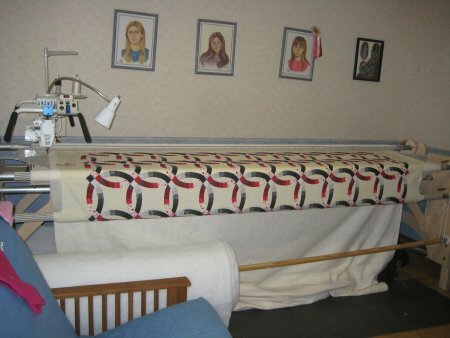 A reverse unit is also made (with the arcs being on the top and right side) and by alternating the basic and reverse unit, you can sew an entire column (or row) with one long, continuous "S"-shaped seam. Pretty doggoned ingenious. The construction sequence (in class) was somewhat disjoint, simply because our instructor wanted us to have enough components to be able to make something recognizable so that we could have the gratification of a completed unit. In reality, once we returned home, we wouldn't need to jump around make this, that and the other thing, we could get into a routine of making "just this one thing" and become rather streamlined about it. So, in 2009, I began in earnest to complete this long-neglected project. I re-familiarized myself with the pieces that were ready to be used, which ones needed to be constructed, how many more strip sets I would need to make and ... oh, Lordy, Lordy .. how many MORE arcs needed to be sewn. Let me say that I was not a terribly gracious seamstress at this point. Making ALL THOSE ARCS was one of the most BORING jobs ... ever. It was the same thing over and over and over ... ad naseum. It almost got to the point where cleaning the bathroom would have been a delightful diversion (but not quite). Finally, I made all the arcs I needed. All the melons and centers were cut. All the units and reverse units were constructed and sewn together into columns ... and the columns were sewn together to make the top. I can not stress how utterly BORING this was. The quilt was turning out to be spectacular but the process was so BORING. Thank goodness it wasn't a king-size quilt! Once the top was constructed, I bought some bamboo batting and loaded the quilt onto my Tin Lizzie .. my longarm quilting machine. I thought quite a bit about the actual quilting design. I didn't want anything too elaborate or girly looking. I wanted something that I could actually FINISH. 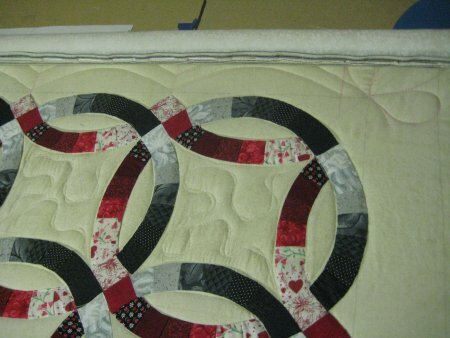 I wanted a continuous line design so there wouldn't be so many stops/starts in the quilting. Just to toot my own horn a bit ... I was really, really pleased with myself that I loaded the top so evenly on the rollers. Look at the bottom rail .. you can see how straight the row is across the entire length: the same amount of arcs show above the rail. To that end, I decided that I would to a stitch in the ditch around ALL the curved arcs. 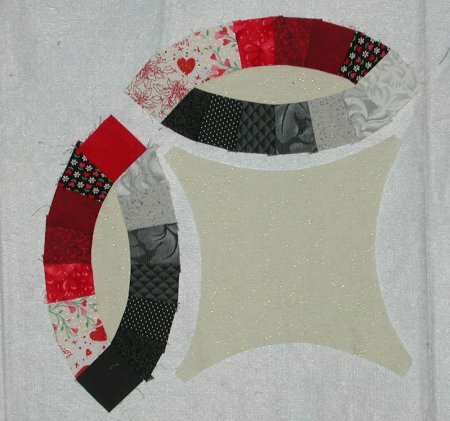 This would completely stabilize the entire top and because the arcs weren't so wide, stitching on either side would eliminate the necessity of quilting inside the arcs. The melons were small enough that no quilting was needed inside them. The center pieces, however, presented the continous line problem. I absolutely did NOT want to stop/start stitching in every single center. That way lies madness. A wonderful solution presented itself by way of a Ribbon Meander: I could start the meander in a corner, create the ribbon on the return path and I would be back where I started .. ready to continue quilting on the next ring. 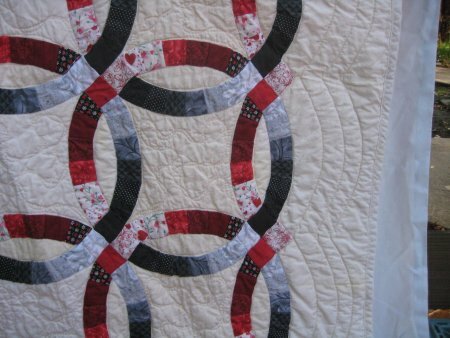 The borders were quilted with arcs that replicated the curved pieced arcs, with a three-lobed "thing" in the corners. I had NO idea what to put in the corners ... and this is what I ended up with. :-) The picture to the left shows the ribbon meander pretty clearly; I was pleased with the way it turned out. The stitch in the ditch was more tempermental ... stitch in the ditch is one of the most difficult things for a longarm quilter to do! Sometimes I was pretty amazingly good and sometimes Lizzie would skedaddle away from me. 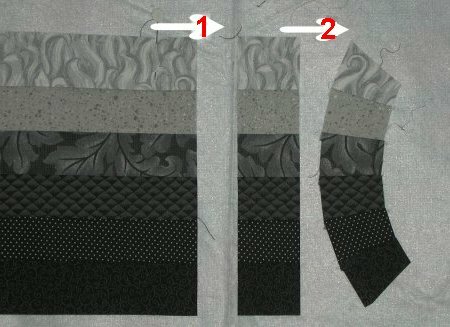 I did use an Appliqlide tool to help me .. and it really did help me retain a measure of control over where I stitched. Because I am not a huge fan of the "old time wrinkled look", I like to preshrink my batting ... since I also wash my fabrics before I use them. However, even with preshrinking this bamboo batting, you can see how very, very wrinkly it became when I did the final wash/dry. ::sigh:: I might as well not have even done the preshrink of the batting .. you can barely even see the ribbon meander. And it looked so pretty when the quilting was going on. In retrospect, it very well could have been that I did NOT preshrink the sparkle cream fabric. Maybe. Could be. The quilt was given to my nephew for Christmas 2009. After the holidays were over, I made a pillowcase to go with the quilt. Unfortunately, the sparkle cream fabric wasn't smooth enough to use as a pillowcase; the sparkle stuff would be a little to "gritty" on the face. 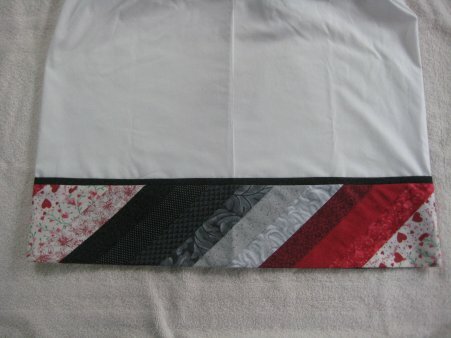 Instead, I used a silky-feeling poly-cotton blend for the pillowcase and the strip sets for the decorative band. The one LAST obstacle to overcome was the constant presence of the Quality Control Inspector. I am here to tell you that it is really, *really*, REALLY difficult to sew the binding around the perimeter of the quilt when a HEAVY cat is always weighing the quilt down.